I came across a beautiful 1942's presentation "Language of Flowers" done at Kew Gardens, London. I was amazed by the shots of the flowers and by the diagram showing the make up of a flower. Did you ever wonder what happens when you press a flower? 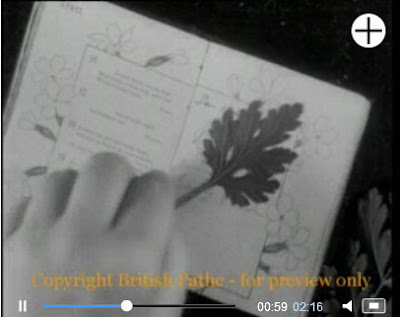 You can always find pressed flowers in my books like those featured in this clip. This historic video-clip embedded is shared by "British Pathe" website, one of the oldest media company of the world, in their Cinemagazines collection (they have all rights for it) and I'm sure you'll like it, too. I cast to earth a seeds. from "The Flower" poem featured in clip.